Towards the end of his life, a sure way to make Beethoven angry was to tell him how much you admired his Septet Op.20, according to the English composer, Schultz, who paid a visit to Beethoven in 1823 and made the mistake of praising the piece. So irritated was Beethoven by the Septet’s success, that he even sometimes claimed he hadn’t written it and that it was in fact by Mozart. That this early serenade from 1799 should eclipse the fame of his more profound later works raised the great composer’s bile and merely confirmed his low estimation of “der poebel”, or the rabble, as he called the public. The Septet was written at the height of Beethoven’s first flush of fame in Vienna when he was beginning to be recognised as the finest pianist around and the successor to Mozart. It was so hotly anticipated that the publisher had it printed by a number of different engravers in separate workshops, none of whom were allowed to see the work as a whole, thus preventing any possibility of a bootleg edition being rushed out prior to the official publication. In order to maximise profits, the work was released in two editions of three movements each; the Septet contained just the sort of finely crafted, melodic and entertaining music that went down a storm with the Viennese and would be played by keen amateurs as well as professional musicians at soirées and gatherings. Is Beethoven right to be so dismissive of this early work just because it exudes youthful spirit and optimism? Its unusual combination of just one violin instead of two, with lower strings and wind, serves to throw the higher voices of the violin and clarinet into bright relief and Beethoven boldly exploits the wind in combination with the strings in a way that is revolutionary for its time. He told the publisher that all the instrumental parts were obligato – i.e. important features not to be omitted – and joked “I can write nothing which is not obligato , as I came into the world myself with an obligato accompaniment”. The last comment seems to refer to the story that Beethoven was born with a caul (part of the amniotic sack) covering his face, a rare occurrence which is said to confer special qualities on a baby. 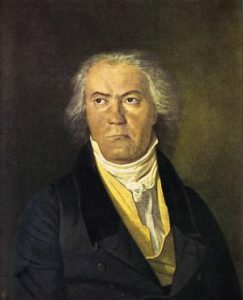 Working on the Septet may have appealed to Beethoven as a way of limbering up for writing a full blown orchestral work and in fact that was the very next thing he did; his First Symphony in C major Op.21 was premièred in the same concert as the Septet, at the Vienna Burgtheater in 1800. However although the Septet owes a huge debt to the serenades and divertimenti of Mozart, it is no light weight. The first and final movements are made meatier by their slow introductions, and both of these movements ask the players for extremes of dynamic ranging from pp to ff, as well as an array of expressive accents to emphasize the most keenly felt notes of a phrase. 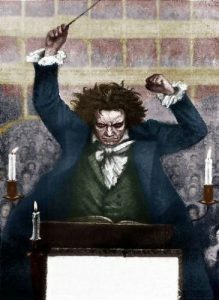 A flavour of the heroic is never far away, particularly from the opening movement; Beethoven was still at this point an admirer of Napoleon’s revolutionary fervour, although that admiration would soon give way to disillusionment. As with the Pathetique Piano Sonata, also written at this period, the second movement Adagio Cantabile is in A Flat Major, a key in which Beethoven seems to feel able to express profound serenity transmuting his ensemble into a heavenly choir and opening with a sublime melody that has been beloved of clarinettists ever since. The third movement Menuetto takes its famous, delightful tune from an early piano sonata in G Major which Beethoven had decided not to publish at that point but which was later brought out as op.49. It is mirrored by the fifth movement which is also in triple time but instead of another dance, Beethoven uses a more symphonic format, a quick-witted Scherzo. Again he is thinking bigger than a mere serenade. The fourth movement’s Tema con Variazioni uses a form of which Beethoven was a supreme master. At social gatherings and concerts he was endlessly asked to improvise variations on any given theme to entertain guests and also to prove his worth as a musician. As he got older and retreated more into the isolation caused by his deafness, he would flatly refuse these invitations, particularly as sometimes they took on a gladiatorial aspect. On one occasion a visiting celebrated pianist, Daniel Steibelt, was so offended at being outclassed and mimicked by Beethoven in an improvisation contest in front of an aristocratic audience, that he walked out and never returned to Vienna. For this excursion into the form Beethoven chooses a simple melody with plenty of scope for melodic and colourful variation. Movement six, Presto, is propelled forwards by its own inimitable Beethovenian energy, pausing only for an unexpected violin cadenza to diffuse the tension before it bubbles over in triumphant conclusion. At the risk of making Beethoven turn in his grave, it has to be said that, even today, over 200 years later, it is impossible to think of a septet to better this one!